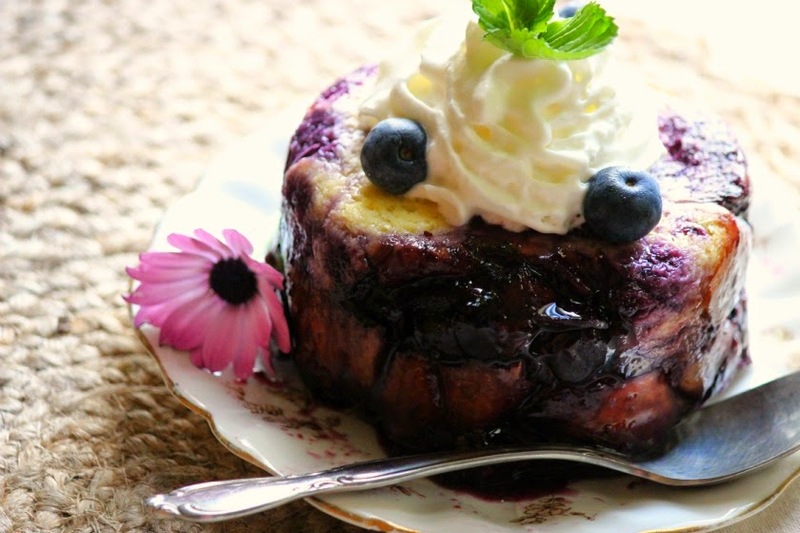 Summer puddings are popular across the board in Eastern Europe, including Britain, not only for their flavor, but because they are a no-bake dessert. They make good use of leftover bread and let ripe summer fruit take center stage. Line two ramekins with enough plastic wrap to fold over the top when filled. In a small saucepan, combined all ingredients and bring to a boil. Let simmer 4-5 minutes until blueberries release all their juices. Cut six circles from the bread the same size as your ramekins. You can place the ramekin on the bread and just cut around it. Place one bread round in the bottom of each ramekin. Place two heaping tablespoons of blueberries and syrup on top of the bread. Repeat with another layer ending with a bread round. Pour any leftover juices over the bread. Fold plastic wrap tightly over filling. Use empty ramekins to weigh down the filling. Refrigerate at least 3 hours. When ready to serve, peel back plastic wrap, invert ramekin onto serving plate. Remove ramekin and plastic. Garnish with whipped cream.